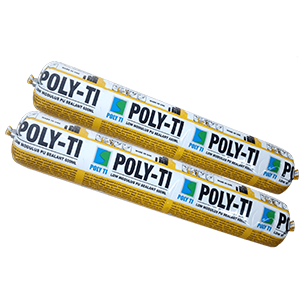 Poly TI is a high performance one part Polyurethane sealant weather-resistant, non-sagging, and water tight with excellent adhesion properties designed for use in all types of joints, vertically and horizontally. Poly TI has a movement capability of ±25% of the joint width, making it ideal for joints. 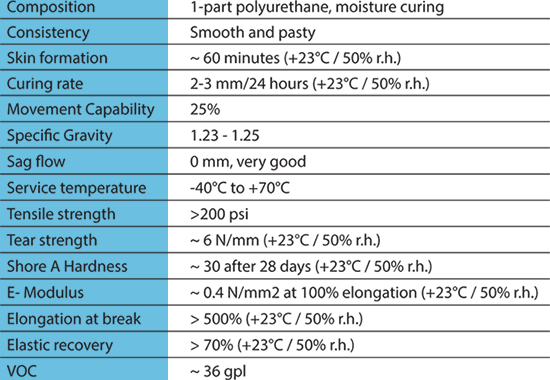 Single component, elastomer polyurethane sealant for expansion joints. - Expansion joints in heavy and light prefabrication and traditional masonry. - Sealing joints for facade panels, curtain walls, boarding, exterior wood finishing. - Joints between frame and preframe, between door frame and masonry. - Adheres on a majority of building supports: concrete, glass, anodized aluminium, wood. Chemical resistance (as an indication): to water, cleaning agents, accidental spills of oils and hydrocarbons, accidental spills of acids and diluted bases. Because of the sensitivity of polyurethanes to UV, clear colours may change over time. This modification is only aesthetic and it does not affect the mechanical properties of the cured product. All joints need to be absolutely clean. For concrete, sand blasting is recommended. All curing compounds, caulks, grease, water proofing compounds etc. need to be removed .For non porous surfaces such as glass, metal etc.cleaning with M.E.K or Toluene is recommended. Polyethylene rod or polyurethane foam is recommended as a joint filler and back up material. Fillers treated with bituminous products, grease or oil should not be used. Where present they need to be removed or separated by vinyl tape or polyethylene film. A preliminary test is necessary on siliconized tiles. It is up to the users to check the compatibility with the surface in terms of adherence, chemical compatibility and staining (make a pre-test if required). Size correctly the joint according to the predictable movements and to the capacity of movement. The width of the joint shall be included between 6 and 40 mm. For the width of joint lower or equal to 10 mm, the depth of the joint shall be equal to its widht. For the widths of joints superior to 10mm the depth of the joint shall be equal in the middle of its width. - If necessary, apply in a thin layer the polyurethane primer. We recommend to use the primer on supports mortars or likened to which the aspect of surface gets closer some mortar (surface ribband and absence of roughness). - After the primer is cured, press a flexible backfilling rod that will not adhere to the sealant. The bottom of joint should not show notches likely to cause bubbling. Protect the edges of the joint by adhesive tape for a better finishing. - Apply the sealant in one layer for joints of small width, in three layers for joints of large width, the two first onto the edges of the joint and the third onto the bottom. Smooth with water free of additives. Press the sealant correctly against the edges and the bottom of the joint while avoiding the air bubbles inclusion. Remove the masking ribbons. - Cleaning of the material with the White Spirit before drying. The cured sealant come out by scratching. - Can be later painted after full curing. Use rather paintings in dispersal (acrylic, vinyl) and realize a preliminary test. The movement of the joint can entail the crack of the painting. Joint width must be designed to suit the movement capability of the sealant. A width to depth ratio of ~ 2: 1 need to be maintained. - 9 months from production date, in original unopened packaging and protected from humidity. - Store in a well ventilated room and at temperature between 10-25°C. Our technical advices on the use of the product are expressed either orally, in writing or by means of tests. They are given to the best of our knowledge. They constitute simple indications which do not engage our responsibility. These values are given as an indication only and they cannot, in any case, be regarded as specifications. Insofar as it is not possible for us to control the use of the product and taking into account the diversity of materials and the possible uses, the users will have to carry out the tests necessary to determine if the product is suited for the specific use for which it is intended. It is up to the users to respect local legislation and to obtain the homologations and authorizations that are eventually required.